"My best friend's mom used to make these for her card club. They are so easy, so good, and make GREAT HOSTESS gifts! I am honored that they shared this recipe with me!" Preheat an oven to 275 degrees F (135 degrees C). Combine the melted butter and onion soup mix in a bowl; stir. Add the pretzel pieces; toss to coat. 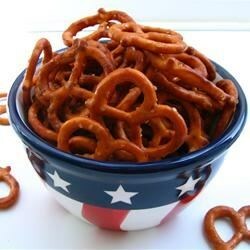 Spread the coated pretzels into the bottom of a large baking dish. Bake the pretzels in the preheated oven for 1 hour, stirring every 15 minutes. Allow pretzels to cool completely before storing in an airtight container. Served these at a ladies function and they weren't well received. Not sure I will try this again, but thanks for sharing. I did this in the microwave as suggested by a reviewer of Bar stool pretzels. This is very good. This is a magnificant snack that is often requested by my friends. I normally add pepper and garlic to the soup mix and use a 16 ounce bag of broken pretzels. You can't go wrong! Yummy! I used unsalted butter. I halved the recipe and it didn't seem like it required that long of a baking time, I think I let them go for about 35-40 minutes. These were a hit at my office! YUM! I used the stick pretzels from cabela's instead of the small ones...turned out DELICIOUS! Crunchy, buttery, onion flavor!